Lifecycle hooks enable you to perform custom actions by pausing instances as an Auto Scaling group launches or terminates them. When an instance is paused, it remains in a wait state for a certain amount of time (one hour by default) or until you continue. For example, your newly launched instance completes its startup sequence and a lifecycle hook pauses the instance. While the instance is paused, you can install or configure software on it, making sure your instance is fully ready before it starts receiving traffic. Each Auto Scaling group can have multiple lifecycle hooks. However, there is a limit on the number of hooks per Auto Scaling group. For more information, see Amazon EC2 Auto Scaling Limits. The Auto Scaling group responds to scale-out events by launching instances and scale-in events by terminating instances. The lifecycle hook puts the instance into a wait state (Pending:Wait or Terminating:Wait). The instance is paused until you continue or the timeout period ends. Define a CloudWatch Events target to invoke a Lambda function when a lifecycle action occurs. The Lambda function is invoked when Amazon EC2 Auto Scaling submits an event for a lifecycle action to CloudWatch Events. The event contains information about the instance that is launching or terminating, and a token that you can use to control the lifecycle action. Define a notification target for the lifecycle hook. Amazon EC2 Auto Scaling sends a message to the notification target. The message contains information about the instance that is launching or terminating, and a token that you can use to control the lifecycle action. Create a script that runs on the instance as the instance starts. The script can control the lifecycle action using the ID of the instance on which it runs. By default, the instance remains in a wait state for one hour, and then the Auto Scaling group continues the launch or terminate process (Pending:Proceed or Terminating:Proceed). If you need more time, you can restart the timeout period by recording a heartbeat. If you finish before the timeout period ends, you can complete the lifecycle action, which continues the launch or termination process. 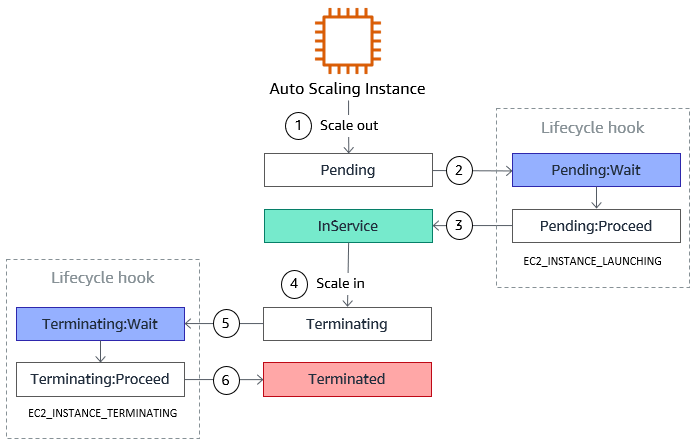 For more information about the complete lifecycle of instances in an Auto Scaling group, see Auto Scaling Lifecycle. Adding lifecycle hooks to your Auto Scaling group gives you greater control over how instances launch and terminate. The following are things to consider when adding a lifecycle hook to your Auto Scaling group, to help ensure that the group continues to perform as expected. Set the heartbeat timeout for the lifecycle hook when you create the lifecycle hook. With the put-lifecycle-hook command, use the --heartbeat-timeout parameter. With the PutLifecycleHook operation, use the HeartbeatTimeout parameter. Continue to the next state if you finish before the timeout period ends, using the complete-lifecycle-action command or the CompleteLifecycleAction operation. Restart the timeout period by recording a heartbeat, using the record-lifecycle-action-heartbeat command or the RecordLifecycleActionHeartbeat operation. This increments the heartbeat timeout by the timeout value specified when you created the lifecycle hook. For example, if the timeout value is one hour, and you call this command after 30 minutes, the instance remains in a wait state for an additional hour, or a total of 90 minutes. The maximum amount of time that you can keep an instance in a wait state is 48 hours or 100 times the heartbeat timeout, whichever is smaller. When an Auto Scaling group launches or terminates an instance due to a simple scaling policy, a cooldown takes effect. The cooldown period helps ensure that the Auto Scaling group does not launch or terminate more instances than needed. Consider an Auto Scaling group with a lifecycle hook that supports a custom action at instance launch. When the application experiences an increase in demand, the group launches instances to add capacity. Because there is a lifecycle hook, the instance is put into the Pending:Wait state, which means that it is not available to handle traffic yet. When the instance enters the wait state, scaling actions due to simple scaling policies are suspended. When the instance enters the InService state, the cooldown period starts. When the cooldown period expires, any suspended scaling actions resume. If you add a lifecycle hook, the health check grace period does not start until the lifecycle hook actions complete and the instance enters the InService state. At the conclusion of a lifecycle hook, the result is either ABANDON or CONTINUE. If the instance is launching, CONTINUE indicates that your actions were successful, and that the instance can be put into service. Otherwise, ABANDON indicates that your custom actions were unsuccessful, and that the instance can be terminated. If the instance is terminating, both ABANDON and CONTINUE allow the instance to terminate. However, ABANDON stops any remaining actions, such as other lifecycle hooks, while CONTINUE allows any other lifecycle hooks to complete. You can use lifecycle hooks with Spot Instances. However, a lifecycle hook does not prevent an instance from terminating in the event that capacity is no longer available. In addition, when a Spot Instance terminates, you must still complete the lifecycle action (using the complete-lifecycle-action command or the CompleteLifecycleAction operation). You can configure notifications when the instance enters a wait state, which enables you to perform a custom action. You can use Amazon CloudWatch Events, Amazon SNS, or Amazon SQS to receive the notifications. Choose whichever option you prefer. Alternatively, if you have a script that configures your instances when they launch, you do not need to receive notification when the lifecycle action occurs. If you are not doing so already, update your script to retrieve the instance ID of the instance from the instance metadata. For more information, see Retrieving Instance Metadata. You can use CloudWatch Events to set up a target to invoke a Lambda function when a lifecycle action occurs. Create a Lambda function using the steps in Create a Lambda Function and note its Amazon Resource Name (ARN). For example, arn:aws:lambda:us-west-2:123456789012:function:my-function. Grant the rule permission to invoke your Lambda function using the following add-permission command. This command trusts the CloudWatch Events service principal (events.amazonaws.com) and scopes permissions to the specified rule. After you have followed these instructions, continue on to Add Lifecycle Hooks as a next step. When the Auto Scaling group responds to a scale-out or scale-in event, it puts the instance in a wait state. While the instance is in a wait state, the Lambda function is invoked. For more information about the event data, see Auto Scaling Events. You can use Amazon SNS to set up a notification target to receive notifications when a lifecycle action occurs. The Amazon SNS topic must be in the same region as your lifecycle hook. Create an Amazon SNS topic using the following create-topic command. For more information, see Create a Topic in the Amazon Simple Notification Service Developer Guide. Note the ARN of the target (for example, arn:aws:sns:us-west-2:123456789012:my-sns-topic). Create a service role (or assume role) for Amazon EC2 Auto Scaling to which you can grant permission to access your notification target. In the navigation pane, choose Roles, Create new role. Under Select type of trusted entity, choose AWS service. Under Choose the service that will use this role, choose EC2 Auto Scaling from the list. Under Select your use case, choose EC2 Auto Scaling Notification Access, and then choose Next:Permissions. Choose Next:Tags, (optional) add metadata to the role by attaching tags as key–value pairs, and then choose Next:Review. On the Review page, type a name for the role (e.g. my-notification-role) and choose Create role. On the Roles page, choose the role you just created to open the Summary page. Make a note of the Role ARN. For example, arn:aws:iam::123456789012:role/my-notification-role. You will specify the role ARN when you create the lifecycle hook in the next procedure. You can use Amazon SQS to set up a notification target to receive notifications when a lifecycle action occurs. FIFO queues are not compatible with lifecycle hooks. Create the target using Amazon SQS. For more information, see Getting Started with Amazon SQS in the Amazon Simple Queue Service Developer Guide. Note the ARN of the target (for example, arn:aws:sqs:us-west-2:123456789012:my-sqs-queue). When the Auto Scaling group responds to a scale-out or scale-in event, it puts the instance in a wait state. While the instance is in a wait state, a message is published to the notification target. You can create and update lifecycle hooks using the put-lifecycle-hook command. To receive notifications using Amazon SNS or Amazon SQS, you must specify additional options. If you followed the previous procedure, your notification target and IAM role are already created. For more information, see Prepare for Notifications. When an Auto Scaling group responds to a scale-out or scale-in event, it puts the instance in a wait state and sends any notifications. It continues the launch or terminate processes after you complete the lifecycle hook. While the instance is in a wait state, you can perform a custom action. For information about how to create a notification, see Prepare for Notifications. To generate a notification for a launch event, update the Auto Scaling group by increasing the desired capacity of the Auto Scaling group by 1. You receive a notification within a few minutes after instance launch. Select your Auto Scaling group. For Desired, increase the current value by 1. If this value exceeds Max, you must also increase the value of Max by 1. After a few minutes, you'll receive notification for the event. If you do not need the additional instance that you launched for this test, you can decrease Desired by 1. After a few minutes, you'll receive notification for the event.